Are you a pork eater? A pork lover? 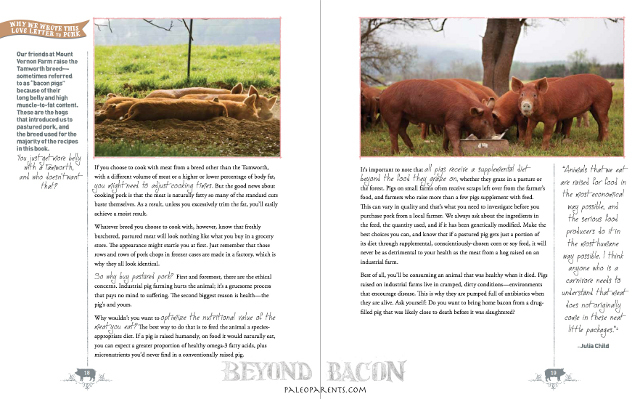 Do you love pork from hogs that have been raised in a humane, sustainable, ethical way? Was I singing your song when I wrote my Ode to Pork? If bacon is your favorite condiment and pork tenderloin makes your mouth water, I’ve got the be all end all of new cookbooks for you. 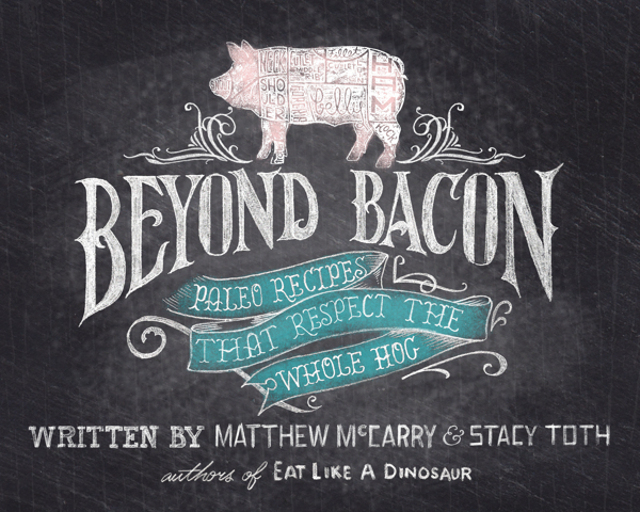 It’s called Beyond Bacon: Paleo Recipes that Respect the Whole Hog. This cookbook is a feast for the eyes. It’s a hardcover keepsake of culinary delight. It pays homage to the humble pasture-raised pig, showing you in beautifully stunning detail how to use every part of the animal in a way that honors the pig’s life and excites your taste buds. “Nose-to-tail” eating is not a new concept; in fact, it’s quite traditional. Yet it’s new to many of us since we were raised in an era of pre-cut, pre-packaged, plastic-wrapped meats sold in supermarkets. We pick out the most popular cuts — like pork chops and bacon — and leave the rest behind. The first section of this cookbook is a tutorial. It argues for pork’s safety and health, for its place at your table. Click on any of the photos below for a larger peek inside the book! You’ll take a walk through Joel Salatin’s Polyface Farm, see how he manages land and pigs in a way that benefits the environment and keeps pigs happy. You’ll learn how to find your own local sources of humanely-raised pork, and then what to do when you order a hog. If you’ve ever ordered a whole animal butchered before, you know how complicated it can be. How do you select a butcher? How do you know which cuts to order? How much do you turn into ground sausage? Bacon? Ham? Do you cure your own meats or pay the butcher to? Do you balk at nitrates or embrace their use? This book will help you navigate this potential minefield of decisions so you can feed your family healthy pork with confidence. And then, just when you think your brain will melt from the overload of valuable information, the cookbook breaks into new territory — dishing up recipe after recipe combined with mouthwatering photographs. The book is simply a work of art. 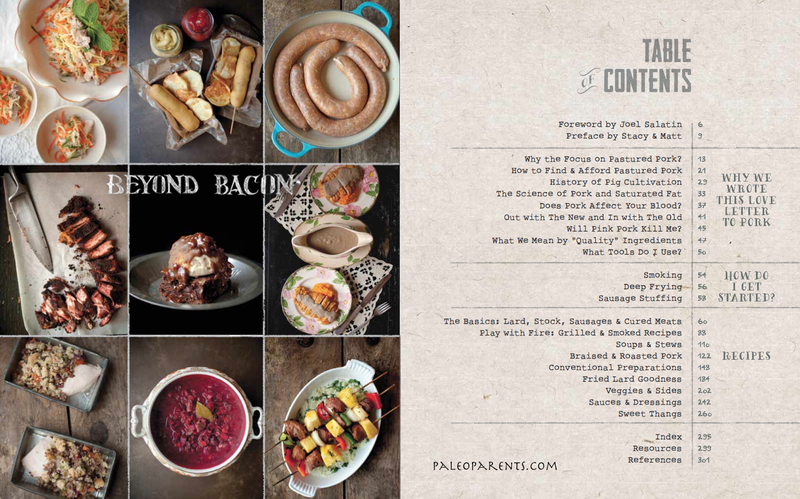 You’ll be riveted to the page while simultaneously eager and inspired to begin your culinary experiments. It’s a rare and pleasurable combination, and in my opinion THE sign of a great cookbook. 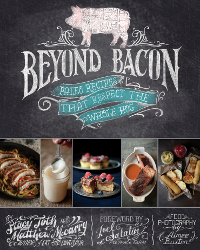 If you are a bacon lover, a pork lover, or simply a lover of beautifully crafted cookbooks, I urge you to buy this book. This is a book I NEED. We have a pork share for half a hog (and I already know I needed to get a full share). I have until the end of the year to get this book but I need to get it for sure. I plan on utilizing as much from our half as I can! please can you suggest another place to purchase the book? Well, I’d suggest going to your local bookstore, then. Even if they don’t carry the book, they can order it for you. I recently was turned on to WILD BOAR… Considered a pig? I am not quite sure! Actually, for culinary purposes, I think it pretty much is! I saw this at Barnes and Noble yesterday. What a beautiful and mouthwatering cookbook. Certainly going on my wish list! I know, right? I’d feel like it was an artistic coffee table book, except it’s far too useful! I bought this, fantastic, highly recommended. I like Farmer and the Grill by Shannon Hayes, Good Meat by Deborah Krasner, and Pig: King of the Southern Table by James Villas. I got some of the last one on discount and passed them out to customers buying whole pigs.